It was a humid, cloudy day not quite hot, but very steamy. We carried water and plenty of insect repellant. When the breeze died down, the mosquitoes swarmed around our heads, legs, and arms. 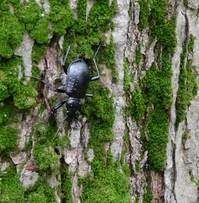 Even before we stepped into the woods, we saw what was to be the defining feature of today’s walk: dozens of large (a little over an inch long), long-legged, black beetles racing up and down the trunk of a red maple tree. Deborah recognized these organisms as “Calosoma beetles,” and it was quickly apparent that these voracious predators were living up to their common name of “caterpillar hunter.” The canopy of the trees all along the trail was full of the “inchworm”, caterpillar larvae of the fall cankerworm moth. These caterpillars were devouring the leaves of the red maple, black cherry, red oak, and witch hazel at a staggering rate. They hung from the destroyed leaf masses by their long, silk threads. Their black frass rained down audibly on us all along our walk. The tiny black pellets covered the unshredded leaves of resistant striped maples and the few, as yet, lightly touched oak and cherry saplings. Many of the hardwood trees were left with a thin haze of leaves that had been totally skeletonized down to their central and lateral leaf veins. The three hours of our walk were dominated by these inchworms and their beetle predators. The trail was covered with scurrying beetles (we didn’t try to capture any more of them…we just took some pictures). Our hats and shoulders were covered by tiny, black frass pellets, and the caterpillars hanging down on their silk threads swung into our faces and packs. You had to alternate watching the trail surface (lots of rocks! Typical Pennsylvania hike!) with watching the space in front of you for dangling caterpillars. The caterpillars were also serving as a food source for birds. We spotted a warbler nest, heard many wood thrushes and robins, and saw several flycatchers that could either have been Acadian or Least flycatchers (poor light and the briefest of glimpses prevented a definitive ID). Once we steeled ourselves to the frass-rainstorm, we could enjoy the beauty of the trail. Great “seas” of ferns surrounded the trail. Our hiking guide book talked of “Christmas ferns” growing abundantly along this section of the trail, but, in fact, these were primarily Hay-Scented Ferns punctuated by individual Evergreen Wood Ferns, Bracken Ferns, and tall, Cinnamon Ferns. There were incredible numbers of low growing, Canadian Mayflower, and taller White Clintonia all in flower. The Mountain Laurel was also in flower. Again, the trail guide (which was first published in 1976) described several views out over the ridge which were now obscured by 30 years of growing trees. It also described extensive thickets of Mountain Laurel which were now greatly reduced and fragmented. The laurel was densely surrounded by Bracken and Hay-Scented ferns. Possibly the laurel stands were falling to incessant shading and chemical competition of the ferns. The Laurel Ridge may be in danger of becoming the Fern Ridge. Black raspberries along the trail were also flowering. Buttercups, wild yam root, Indian cucumber root, cat brier, and Solomon’s Seal were also growing in abundance. The Laurel Highlands Trail is a treat to hike. Following the yellow blazes through the dense stands of young trees and ferns, coming across the occasional old tree of great girth and height, listening to the abundant birds singing and thriving in the moist, productive ecosystems made the afternoon just fly past. There were great masses of sphagnum moss billowing up alongside the trail. In some, wildflowers and even tree seedlings had spouted. Deer and raccoon tracks were thick in the wet spots of the trail. No amphibians or reptiles or mammals were seen, though. It was a day of caterpillars, beetles, and birds. We got back to the car right at 5 pm and, as predicted by Weather.com, it started to rain. We drove into Greensburg to wait for the 6:50 train from New York. Picked up a pizza on the way home and enjoyed a long shower and our evening. Laurel Highlands offers a bounty of outdoor activities. Seven Springs Rentals such as our 3-bedroom guest house among lots of good accommodations. those beetles look awesome, and ‘black frass’ is a new phrase for me…remember I majored in Philosophy-religion…and I will envision it for some time now.